Informtainment.com by ORLANDO: mistavybeworld.com launched! Mista Vybe has made his presence felt online. 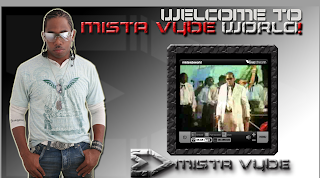 It was no shocker when I got a newsletter stating that Mista Vybe launched his new website. The neat thing about this website is all the social media links to Mista Vybe and the on demand videos with Mista Vybe talking directly to his fans. Mista Vybe you are moving in the right direction with the new website. Much continued success!